Hip dysplasia is the result of a growth disorder whereby the socket portion does not fully cover the ball portion. 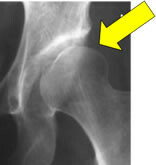 This means the weight-bearing section of the hip joint is smaller than normal. Relative overpressure is created as a result, which leads to accelerated wear and tear of the cartilage. Complaints manifest in pain in the groin or on the outer side of the upper leg brought on by sudden movements or during or after exercising. In an early stage, hip dysplasia can be treated by periacetabular osteotomy. This is only possible if the joint still has good mobility, if the femoral head has not flattened and there are no visible signs of osteoarthritis revealed by an X-ray. During this procedure the hip socket is detached from the pelvis and rotated around the femoral head and then re-attached. The procedure is performed to reduce pain, improve the distribution of pressure on the cartilage and therefore prevent premature osteoarthritis. It should be noted that it is an invasive procedure that requires a three to six-month recovery period. In an advanced stage, with the presence of pronounced osteoarthritis, the final treatment involves a total hip replacement.